As fans of any horror movie know there are a few things that are staples in any scary movie: old houses, disembodied voices, little children and demon possession. “Don’t Be Afraid of the Dark,” a remake of a 1973 television horror film, has three out of those four. Written and produced by Guillermo del Toro and directed by first timer Troy Nixey, “Don’t Be Afraid of the Dark” has been in limbo for a few years since it was shot. Premiering at a screening at the 2010 Comic Con, the film received positive buzz. It was due to be released in January of this year, but all distribution plans were halted when Disney started to sell Miramax. Now, the film is ready to be seen and will be released Aug. 26, 2011. When quiet and reserved Sally (Bailee Madison) moves into a new house with her father Alex (Guy Pearce) and his new girlfriend Kim (Katie Holmes), she realizes that the huge estate is fun to explore and has many exciting places to see. When she goes to the very underbelly of the house, she discovers a pathway way to an even lower secret level that hasn’t been accessed for more than a century. Sally accidentally opens a gateway that has kept villainous creatures locked up and then the trouble begins as they start to come after her. Can she get her father to believe her or will the salvation of her family rest on her convincing her father’s girlfriend Kim that there is something sinister going on in the house? There are so many interesting parts of this trailer — from the look of the film, to dramatic camera angles, and, of course, the unique looking creatures that appear to be very small when you see them dragging Sally across the floor. Usually, a movie being in limbo for a few years is typically a bad sign, but seeing as the majority of the reason for the hold-up was for business reasons and not lack of confidence in the film, I can see this movie doing quite well. Originally meant to be a PG-13 film, the MPAA rated it R for “pervasive scariness” and when del Toro asked what they had to remove to get it to a PG-13 rating, the MPAA replied, “Why ruin a perfectly scary movie?” I think it’s a good sign that it is rated R and not just for blood or language, but that it is genuinely scary. also, interesting about the rating for this. I’m glad it stuck with the “R”. Oh I gotta see this movie. Would have to agree with Sienna on thumbs up for Guillermo del Toro. Love his body of work. 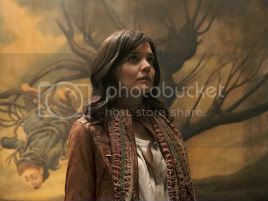 I’ll give Katie Holmes a chance considering she does have her ups and downs in her performances. I am not usually a horror film type of girl, but I would definitely like to see this movie.